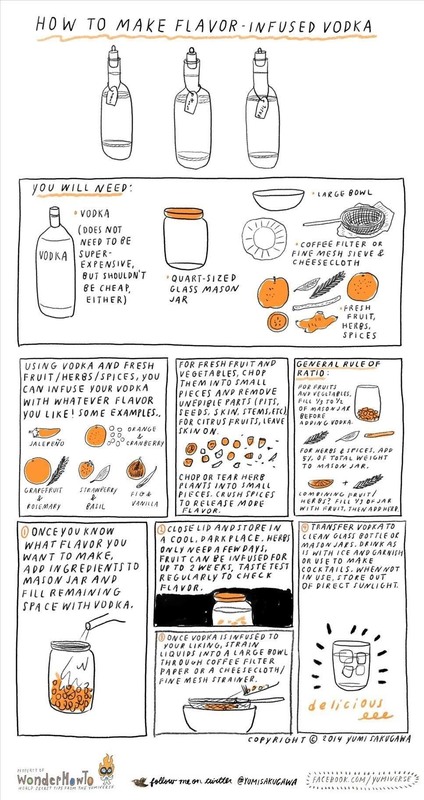 It may sound complicated, but making your own flavor-infused vodka is effortlessly easy with delicious results, and it makes for a great last-minute holiday gift. All you need are some fresh fruit and herbs, a quart-sized mason jar, a bottle of vodka (make sure it isn't the super-cheap kind), and a few days of waiting time. The great thing about making your own flavor-infused vodka is that you can create whatever flavor combination you like, whether it is strawberry and basil, cranberry and orange, grapefruit and rosemary, or fig and vanilla. Once the flavors are done infusing, strain ingredients into a bowl through either a paper coffee filter, cheesecloth, or fine-mesh strainer, then pour the remaining liquid into a clean glass bottle or the original (cleaned out) mason jar. Enjoy your newly created vodka with ice or use to make cocktails.